For the ultimate in weather monitoring, add WeatherLink to your Vantage Pro or Pro2. 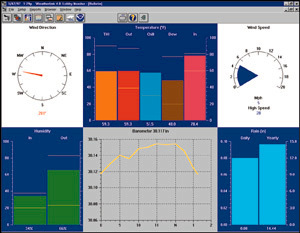 The data logger fits neatly into the weather station console or Weather Envoy, storing weather data even when its not connected to your PC. Later, download the data and use the software to create graphs, generate summaries, and more. Includes software on CD, data logger, and 8 (2.4 M) cable to connect the data logger to your computer. Choose a logging interval of 1, 5, 10, 15, 30, 60, or 120 minutes. Depending on the logging interval, store up to six months of data before downloading.